Jason Kolar - Modified Perspectives. Vinyl LP. Bleep. Nosedrip veers off into the world of contemporary music with his ever-expanding Stroom imprint on this new Jason Kolar album. 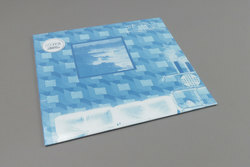 Deep and introspective ambient type business full of lush tones and subtle melodies, the ten compositions on Modified Perspectives have been on repeat around here for months. The wonderfully titled ‘Erratic Texting Behaviour’ deserves a special mention whilst ‘Holding No Hands’ recalls those early Durutti Column moments you always wished lasted longer. Another super good one on one of our labels of the moment! PS these don’t hang around forever.